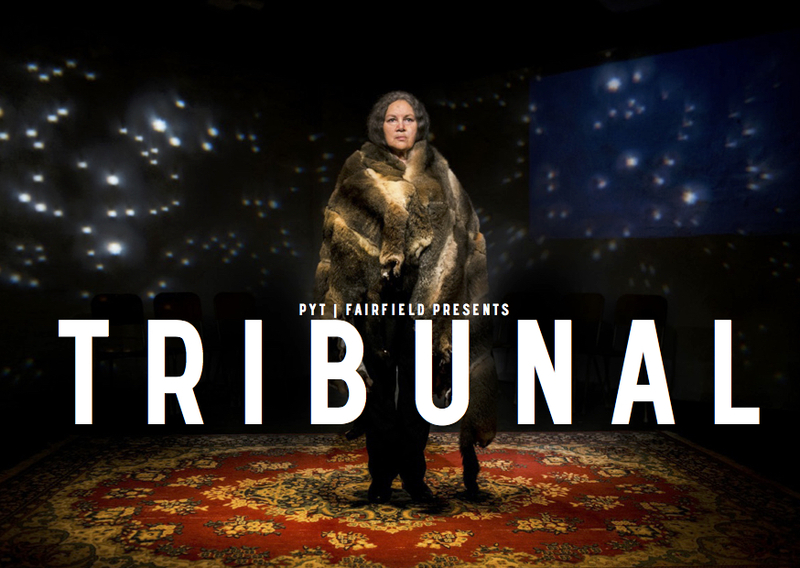 PYT FAIRFIELD presents, TRIBUNAL, a devised verbatim work led by Karen Therese, at the PYT Performance Space in Fairfield. 2 March - March11. TRIBUNAL, was presented last year in a short and sold out season at the SBW Stables Theatre. This re-mounting of the work has been prepared for the local audience of Fairfield, the 'home' of the young theatre company. What was exciting about the showing in Fairfield is to experience the sense of community and its support for one another. In the foyer we were regaled by The Choir of Love, invited to dance, and offered coffee and tea with some savoury and sweets from The Parents Cafe, an Iraqi organisation working within the Fairfeild community, for the community. The respect and gravity was palpable. Then, we were led into the theatre for the performance of Tribunal. TRIBUNAL begins with Aunty Rhonda Grovenor Dixon, robed in her possum skin cloak, welcoming us and calling into order a tribunal. On a small red carpet the participants stand and we hear, during the performance the story of the Indigenous people and, especially, of Aunty Rhonda's personal story, living in Australia as an Indigenous woman, over the recent past sixty odd years. We also meet Mahdi Mohammadi and Jawed Yaqoubi, two Middle Eastern refugees, with a joint and individual story in dealing with the Australian Government authorities in their pursuit of safety from a murderous regime. They have been here, relatively, only months. Karen Therese repeats verbatim the story of a lawyer and his interaction with the Australian bureaucracy in his efforts to assist the refugees. Katie Green, an ex-Red Cross worker, talks of the chaotic process that she participated in in assisting arriving refugees, whilst Paul Dwyer, who has edited the material thrown up in the rehearsal/development process, participates as an actor to facilitate the inter-active scenes of the performance. The audience is invited to ask questions and comment. Sarah Coconis gave some insight into the psychological impact of the refugee treatment in the Detention Camps and the practice of the many different Visa conditions applied by the authorities. In just over an hour much is revealed. Having seen TRIBUNAL in its first incarnation, I was impressed with the development of confidence and impact of the content of the work that as grown over time. All the artists seem to be in much further control of what they are doing and the subsequent power of the simple storytelling is even more provocative and unsettling. The artists seem to be comfortable in their local environment, modest, humble and simple with no sign of anger, rather patience and hope. This is a work that is of vitality and importance coming from within a local community facilitated by PYT, a theatre company in the local converted School of Arts Hall. It is a performance that needs to be witnessed. The seriousness and honour of this group of artists is palpable. Sound Design is by James Brown. Video Design by Sean Bacon. Two valuable assets to the work. The excitement of arrival in the welcoming Fairfield home of PYT is balanced by the sobering information of the work. But, however, stirred to anger and/or frustration, a feeling of democratic/human impotence percolates up in regard to the governmental policies. What can I do? One does feel, that TRIBUNAL, at its conclusion reveals the exhilaration of a community that is united to speak of such urgent and confronting issues, concerning us all, and one's spirit is raised to a state of respectful awe. 'We dedicate The TRIBUNAL to the lives of the 55 asylum seekers who drowned on the 10th June 2013 as sat in Adelaide and London developing this work. Their tragic death formed the inspiration of the work."